Aziday tablet: Each film coated tablet contains Azithromycin Dihydrate USP equivalent to Azithromycin 500 mg. Aziday 20, 35 & 50 ml dry powder for suspension: After reconstitution each 5 ml suspension contains Azithromycin dihydrate USP equivalent to Azithromycin 200 mg.
Aziday (Azithromycin) is an azalide antibiotic, a subclass of macrolide antibiotic. Aziday (Azithromycin) acts by binding to the 50s ribosomal subunit of susceptible microorganisms and thus interfering with microbial protein synthesis. Aziday (Azithromycin) has been shown to be active against most strains including Staphylococcus aureus, Streptococcus agalactiae, Streptococcus pneumoniae, Streptococcus pyogenes, Haemophilus ducreyi, Haemophilus influenzae, Moraxella catarrhalis, Neisseria gonorrhoeae, Escherichia coli, Chlamydia pneumoniae, Chlamydia trachomatis, Mycoplasma pneumoniae, Bacteroides fragilis, Legionella pneumophila, oxoplasma gondii both in vitro and in clinical infections. Aziday (Azithromycin) is indicated for infections (caused by susceptible organisms) in lower respiratory tract infections including bronchitis and pneumonia, in upper respiratory tract infections including sinusitis and pharyngitis/tonsillitis, in otitis media, and in skin and soft tissue infections. 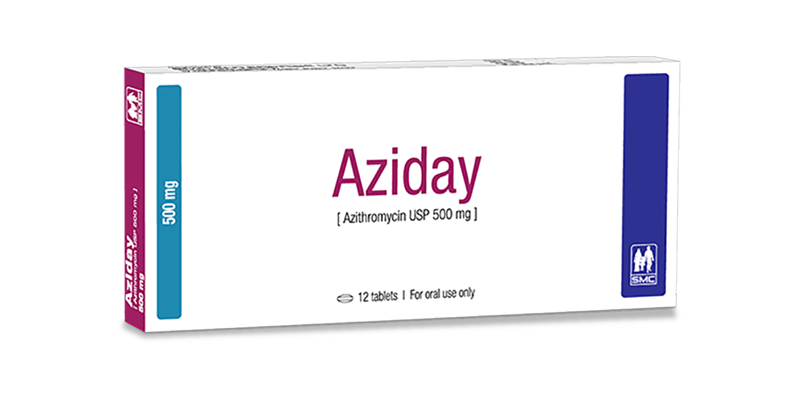 In sexually transmitted diseases in men and women, Aziday (Azithromycin) is indicated in the treatment of non-gonococcal urethritis and cervicitis due to Chlamydiatrachomatis. Aziday (Azithromycin) 500 mg tablet can be taken with or without food. To reconstitute Aziday (Azithromycin) 20 ml, 35 ml & 50 ml powder for suspension, add 12.5 ml, 22.5 ml, 32.5 ml (with measuring cup) of just boiled and cooled water to the content of the bottle and shake well to mix uniformly. Adults: For lower respiratory tract infections including bronchitis and pneumonia, upper respiratory tract infections including sinusitis and pharyngitis/tonsillitis, otitis media and skin and soft tissue infections, the total dose of Aziday (Azithromycin) is 1.5 gm given as 500 mg once daily for 3 days. An alternative to this dosage schedule is that 500 mg Aziday (Azithromycin) once daily on day 1, followed by 250 mg Aziday (Azithromycin) once daily for next 4 days. For sexually transmitted diseases caused by Chlamydia trachomatis, the dose of Aziday (Azithromycin) is 1 gm given as a single dose alternatively 500 mg once daily on day 1, followed by 250 mg Aziday (Azithromycin) once daily for next 2 days may also be given. Use in the elderly: Normal adult dosage is recommended. Children: The dose of Aziday (Azithromycin) in children over 6 months of age is 10 mg/kg body weight once daily for 3 days. Alternatively, 10 mg/kg on day 1, followed by 5 mg/kg for next 4 days is also recommended. There is no information on use of Aziday (Azithromycin) on children less than 6 months of age. Azithromycin is contraindicated in patients hypersensitive to Azithromycin or any other macrolide antibiotics. Beacause of the theoretical possibility of ergotism, Azithromycin and ergot derivatives should not be co-administered. Azithromycin is contraindicated in patients with hepatic diseases. Azithromycin is well tolerated with a low incidence of side effects. The side effects include nausea, vomiting, abdominal discomfort (pain/cramps), flatulence, diarrhoea, headache, dizziness, and skin rashes and are reversible upon discontinuation of therapy. Recent clinical studies have recommended that Azithromycin should be considered for the initial treatment of chlamydial cervicitis in pregnancy. In other infections, Azithromycin should be used only when clearly needed. It is not known whether Azithromycin is excreted in breast milk. Exercise caution when administering to a nursing woman. Precaution should be taken in patients with more severe renal impairment. Avoid concomitant administration with Terfenadine or Astemizole. Antacids: Peak serum levels but not the total extent of absorption is reduced by Aluminium & Magnesium containing antacids in the stomach. Azithromycin should therefore be taken at least 1 hour before or 2 hours after taking these antacids. Ergot Derivatives: Because of the theoretical possibility of ergotism, concomitant administration of ergot derivatives and Azithromycin should be avoided. Digoxin & Cyclosporin: Macrolides have been known toincrease the plasma concentration of Digoxin & Cyclosporin so caution should be exercised while co-administration is necessary. Anti-Histamines: A potentially life threatening interaction between Erythromycin and Terfenadine or Astemizole have been reported. Although such an interaction with Azithromycin is not established yet, so it is wise to avoid concomitant use of Azithromycin and Terfenadine or Astemizole. Keep out of the reach of children. Keep below 30° C, protect from light. Aziday tablet: Each box contains 2x6's tablet in Alu-Alu blister pack. Aziday 20, 35 & 50 ml dry powder for suspension: Each bottle containing dry powder for the preparation of 20 ml, 35 ml & 50 ml suspension with a measuring cup and a dropper.